1. The Brewfest Event will be available to Players at level 20 and on Servers that are older than 9 days. For this Event, Players can craft a variety of different brews, try the brews of others, and earn great rewards for their participation. 2. To start brewing, players select a material (each material comes in 3 qualities). Better materials will result in better brews. The Brew Value increases depending on the quality of material used, with a chance for 2x and 3x crit increases. 3. Brewing uses 1 material when Fatigue is below 49%, 2 materials when Fatigue is between 50-99%, and 3 materials when Fatigue is at 100%. Each brewing will increase your Fatigue by 1-3%. 4. There are 25 Brew levels. The higher the brew level, the more Brew Points players will earn. Only brews above level 3 can sent for Casking. Brews that reach lv.23 can be automatically added to the server's Drink Buffet for other players to Carouse. The drinking player will get a Carouse gift while the brewer will get Recognition points. 5. Players will get Brew Titles based on their Recognition points. Each day at 12:00 p.m and 6:00 p.m players will receive brew materials based on their title. The higher the title, the more materials awarded. 6. 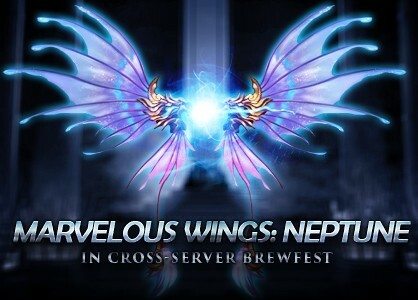 During the event, Players that earn a total score of 1000 Brew Points will be added to the Cross-Server Brew Rankings. Players will earn great rewards depending on their rank. 7. Points can be spent in the special Point Shop to trade for all kinds of items. Please make sure to spend your points before the event ends!